BEACON FALLS — History can go one of two ways: It’s either lost forever in time or kept alive so the stories can be passed through generations. Woodland’s Preserving Our History group wanted to make sure it helped with the latter. Nine students, along with group advisor Meghan Hatch, recently produced an award-winning short documentary chronicling the military career of Staff Sgt. Christopher Shea, a 2004 Woodland graduate and a member of the Connecticut Army National Guard. 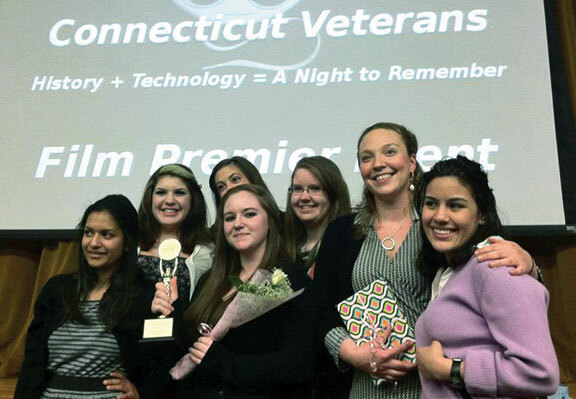 The documentary, a six-minute piece entitled “A Life of Service,” earned awards for Outstanding History Short and Critic’s Choice at last month’s Connecticut Student Film Festival. “A Life of Service” tells the story of Shea, who served during the War in Iraq as a gunner and experienced post-traumatic stress disorder after returning from the Middle East. The group, which is part of a statewide program focusing on veterans’ stories, decided to focus on Shea due to his close relationship with the school, where he often returns to tell his stories from war and raise awareness for veterans’ care. The students, including Machol Butler, Emma Conway, Will Drozdowski, Casey Gianonne, Rebecca Grabowski, Sarah Parker, Cindy Salazar, Salma Shitia, and Mackenzie White, worked on the project for months. Drozdowski led the editing and music production while Conway led the storytelling aspect of the piece. The group also worked with students from the digital media and journalism courses to help with aspects of the production. Shea, who will be deployed to Afghanistan this fall, provided photos and videos from his duty in Iraq to accompany his interview. The group won the competition’s top prize for the second time in three years. The group also won the Outstanding History Short award in its first year, 2010, under the direction of history teacher Chris Decker.